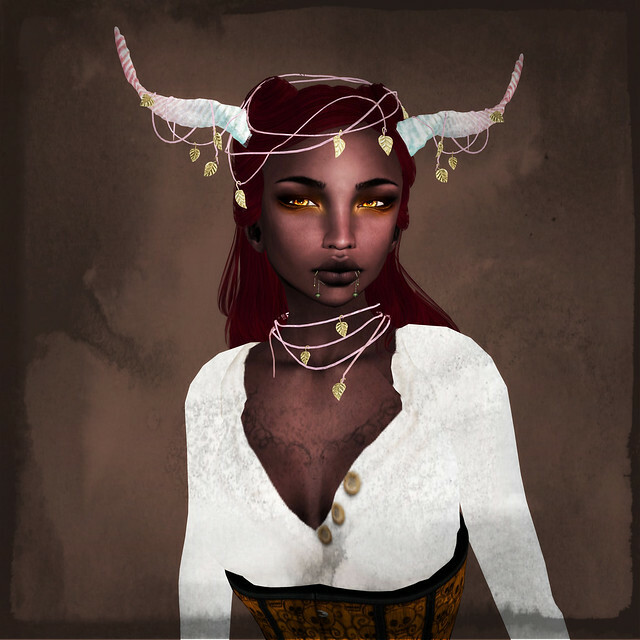 My dearest partner Jackal made gorgeous horns and jewelry for the Spring edition of We Heart RP! The horns come in many different colors, and the jeweled leaves come in silver and gold. They're so delicate and elven that I’m pretty sure you’re gonna get sick of how often I wear this set. It's a testament to the awesomeness of Toast's skins that I can wear makeup meant for the wrong skintone (oops!) and still look like a sunburnt Frida Kahlo babe. Yes, I'm a silly blogger who doesn't check before photographing, but because I still somehow looked good, I decided to keep these pictures anyway! By the way, this skin doesn't come with appliers, so I gave my best guess with the Slink hand skintone. The Slink hand hud doesn't have the mottled and varied delicacy of the skin, so it's tough to match, but it's possible to pretend with a long-sleeved shirt. Worth it, too, I think! Anyway, despite the wrong makeup and mismatched hands, I love this skin! The rest of my outfit comes from Kustom9, which has moved over here. Have you ever read the L. Frank Baum story Ozma of Oz? I believe this is the Oz book about an evil witch who keeps the heads of pretty women so that she can switch them out whenever she feels like looking different. I felt a bit like that today when I removed my head and stuck on the new Slink Emma, but without quit so much dismemberment. I enjoyed playing with Emma's face, I admit, although I don't -- quite -- feel -- myself, today. I like her smirk, I like her closed eyes, and I like the three kinds of Slink skin options. The different lip and eye options are fun, but seriously, it's simply nice to have some expressions on my good old face. The rest of my outfit is older releases from dear friends, credits below. I am off to Megacon, which reminds me a lot of Real Life SL, so have a lovely Sunday! My outfit is by Lassitude & Ennui. Jackal made it a while ago, one of her first few Mesh dresses, and I still love the soft shading of it.